So split testing has been around for a long-time and email marketers do use it but there’s more than likely still a lot of people that think it’s going to be too complicated, too time consuming or too costly to make the use of it practical. The fact is, it doesn’t have any of those issues and actually it’s a really simple and effective way for any email marketer to work towards increasing response rates. ‘Split Testing’, ‘A/B testing’, the technique has other names too but they’re all the same thing. Essentially, Split Testing enables you to run more than one subject or email template to automatically determine which produces the best response. We all know subject lines are hard and sometimes you can be unsure on which to go with when you have a few in mind. It’s the same with email templates when you don’t know which feature image or call-to-action to run. It may be that you have a couple of variations by design because you’re clear on what you want and that’s cool too. Split testing is flexible enough to allow you to set-up and send whatever you’ve planned for your campaign. The number of ‘splits’ you can divide an email campaign into varies depending on your ESP but typically people will use 2, which is where the ‘A/B’ name comes from. You decide what the split test is based on from one of opens, clicks, number of conversions or the value of conversions and you choose how long you want the test to run for before the winner is chosen. Set the size of each split as a percentage of the total users and if you don’t want there to be a ‘winner’ because you just want to send random variations then you can make the total size of the splits equal to 100%. Before delivery starts the email addresses are randomly selected for each split from the lists you’ve chosen. All splits are delivered at the same time making it a truly fair test. The metrics for each split are tracked so when it comes to choosing a winner we know which has performed the best. At the ending of the testing phase the winning split is identified and the remaining users are all delivered that content. The main idea of split testing is to get the users to tell you what works best rather than you deciding for them. It’s not possible to say ‘You will definitely get a 9% click rate’ or anything like that but what you can expect is for your users to tell you which content they like the most by way of increased response for that split. The results you get are more likely to inform your future campaigns as you’ll start to get a better understanding of what works and what doesn’t through split testing. In some ways you can view split testing as a way of getting 3, 4, 5 or 5 campaigns worth of feedback all in one go. Finding out work works is key and you’ll then be well on the way to bumping up those response rates. It shouldn’t be and we’d be surprised if there are any solutions that charge extra for sending a split test. Sure, you may have to think of another subject or vary a template slightly but that’s time more than anything. Any extra time you do spend should be offset by the increase in response rates so providing you’re doing it right then it’ll pay off. 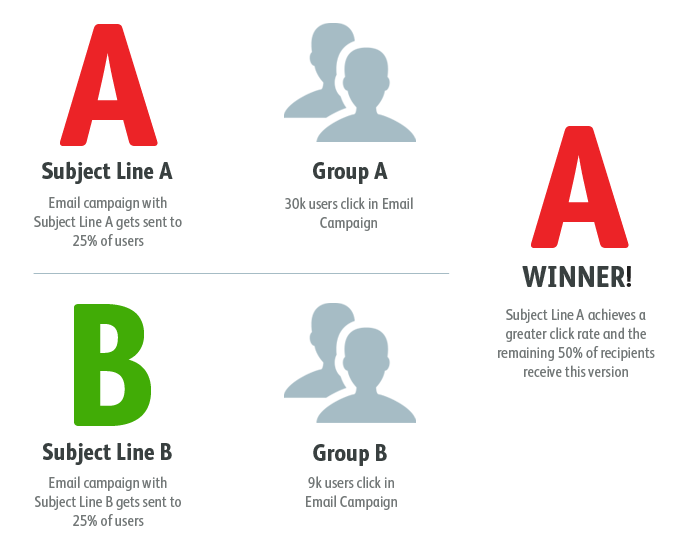 Split testing is a great way of varying email campaign elements without having to set-up data for individual users or needing to pre-segment your lists. If you’re thinking more along the lines of dynamic or conditional content, to produce user-specific emails based on the information stored in your lists, then you should take a look at using something like our template language.